This is why more than 21% of Canadian mid-market manufacturers turn to Synerion for its flexible, best-in-breed workforce management software, designed to make scheduling easier, reduce errors, and streamline processes. In fact, Synerion got its start in the manufacturing sector, and these deep roots are revealed in solutions proven to reduce production and labor costs, pinpoint workplace issues and trends, and provide the intelligence to find better business solutions. Synerion’s workforce management manufacturing solution was adopted by Bemis Flexible Packaging, a world leader in specialty packaging, after it purchased the Alcan Packaging Food Americas division, including its manufacturing plant in Toronto, in 2010. Among the challenges the Toronto facility faced was manual time tracking of the largely unionized workforce, a labour-intensive process prone to human errors. Regulatory compliance and controlling labour costs were also issues. Synerion’s workforce management solution included a biometric hand-scanning system – instead of punch clocks – automatically providing time-and-attendance data to the system, providing rich, accurate data about employee performance that could be translated into dynamic business insights and decisions. “The overall new process introduced by Synerion, beginning with the initial automated data gathering, and through payroll processes, has saved us, at a minimum, 20% of work time including supervisor work, payroll work and the work of others involved in the process,” says Iain Morton, Human Resources Manager of the Toronto facility, Bemis Flexible Packaging (Milprint Division). Part of the Nortek group of companies, Broan-NuTone Canada, is a manufacturer focusing on central vacuum systems, as well as serving as a resource to the Canadian market for the products and services manufactured by other members of the Broan-NuTone Group. 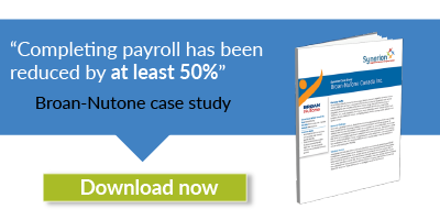 With a fast-growing workforce, Broan-NuTone knew their paper-based spreadsheets were time-consuming and error-prone in attempting to balance attendance for payroll and benefits purposes. They also knew that this method wasn’t as accurate as an automated system, and wouldn’t help them in performing due diligence in complying with labour laws. To solve these issues, the Mississauga, Ontario manufacturer turned to the workforce management solutions of Synerion. A workforce management system was put in place to handle Broan-NuTone’s unique needs, with HandPunch biometric data collection terminals installed for both plant and office personnel. Other data collection terminals were put on the plant floor to help with the many job transfers plant workers performed during their shifts. The devices connected with Synerion’s TimeZone software, allowing supervisors to make any necessary adjustments on the fly, while payroll operators ensured data being passed to payroll was approved and accurate. With the new systems, the labor hours associated with completing payroll has been reduced by at least 50%, through seamless integration with the payroll provider. As well, management has become more compliant with human resources policies, while supervisors have a more efficient way to provide attendance data to payroll. And plant supervisors use job costing to ensure optimum efficiency level on the plant floor. To see how Synerion’s workforce management software solutions – proven with more than 30 years of worldwide success, and over 5,000,000 global users – can help your manufacturing operation, contact us for a consultation with one of our experts, or arrange for a free live product demonstration.